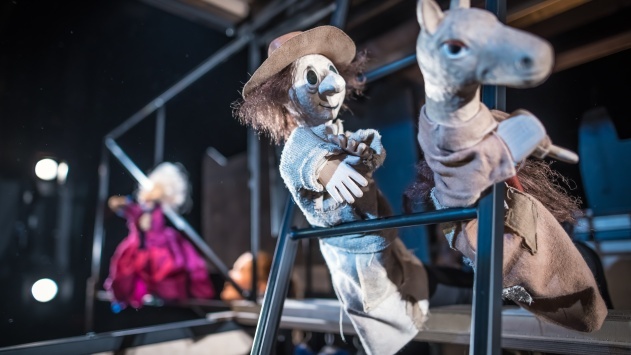 The text for the wild puppet adventure Martin Krpan is based on the folk tale by Fran Levstik, published in The Slovene Herald (Slovenski glasnik) 160 years ago. Throughout its history the famous story about a courageous, strong, lucid, ordinary and modest hero lived to see many of its reprints, adaptations, illustrations, radio plays, theatre adaptations, and even an animated cartoon film. Although he was well aware of the fact that the then mostly illiterate, ordinary Slovenian people needed a simple story about a peasant hero, whom they could understand and identify with, Levstik, when conceiving his tale, succeeded not to fall into an unambiguous writing. Puppets, costumes and set production: Zoran Srdić, Iztok Bobić, Zala Kalan, Polona Černe, Sandra Birjukov, Marjeta Valjavec, Igor Remeta, Olga Milič, Špela Ulaga, Hana Juta Kozar, Žiga Lebar, Špela Trobec, Jože Lašič, Ivan Božičko (CNC), Cveto Kuniševič (3D sken), Nejc Šubic, Vladson, Zlatko Djogić, Lara Mastnak, Uroš Mehle s. p.